Unity has finally added integrated support for developing 2D games with the availability of version 4.3 of its toolset. Unity's cross-platform development tools can be used to simultaneously create games for a multitude of different platforms, including smartphones, PCs and Web. Until now Unity has focused on 3D game development, but that changes in version 4.3, which was released on Tuesday. For over a year the company has been working on an integrated physics engine and making it easier for developers to import, manipulate, and work with 2D objects. Users will also be able to mix 2D and 3D as they see fit, according to Unity. 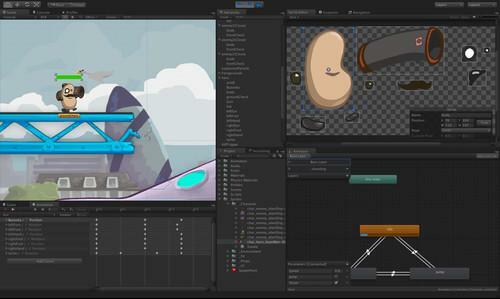 To help users understand the development process, Unity has created a demo 2D game level. A 28 minute long video shows developers how to set up a 2D project and how to build a game layer by layer. The 2D tools have already been used by the Night in the Woods Kickstarter project, Unity said. The game was fully funded after 26 hours, and on Tuesday future users had pledged about US$149,000, well over the $50,000 goal. It currently runs on PC and Mac, and more platforms will be added as development continues. The addition of 2D tools is an important milestone, said Unity CEO David Helgason, but it's not all that's been added to and improved in version 4.3. Unity has also worked on the Mecanim animation system, the IDE and its Windows integration.